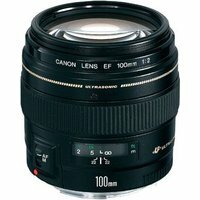 The Canon EF 100mm f2 USM Lens features a large aperture and compact size. The first lens group moves for rear focusing, and sharp, crisp pictures are obtained at all apertures. The background blur is ideal for portraits. The USM autofocuses the lens quickly and quietly.